Stone Cottage is a charming small property with character features located in the Wye Valley on the outskirts of Hoarwithy. Recently renovated, it is perfect for fishermen, couples or a small family to get away from it all with one double room and one single. The main living room has a wood burning stove, there is a well appointed kitchen and modern shower room. Well positioned between Ross and Hereford, there is much local fishing available, lovely walks and plenty of good pubs to choose from. There are wonderful views over the Wye valley from every room. I worked in the City until after my children were born. I bought our house in Herefordshire as a bolthole from London and to be near my family. We now have 2 children and 2 dogs and Herefordshire is my favourite county in the whole of the UK. Being able to share the cottage next door with other families who enjoy the surroundings as much as we do gives me great pleasure. My husband has recently retired enabling us to live at home for the first time in 20 years! This village is our home and our house is next door to this cottage. We bought it because we had the opportunity and decided to do self-catering holiday lets. Herefordshire is one of the most beautiful (in my opinion) counties in England and certainly one of the least spoilt. As you will see from the views from the cottage, it is stunning countryside and while public transport is is not great that adds to the charm of the county. From the River Wye to the Black Mountains, Malvern Hills and Forest of Dean there is outstanding natural beauty and we hope visitors will enjoy it as much as we do. The peace of the countryside and watching the seasons change over the Wye Valley are very special features. In winter especially the cottage is very cosy with a very effective wood burning stove and it is a wonderful place to just hide away in for a few days. There is one bathroom with power shower, wc and basin. One basket of logs is supplied for each let. There are plenty of places nearby to purchase extra logs if required. The cottage has one cosy living room with wood burning stove, sofa and rocking chair, TV, DVD player and internet access. The cottage is fully central heated. A basket of logs is supplied, extra can be bought locally. The kitchen is well appointed containing an electric cooker with hobs and two ovens, a fridge/freezer and washing machine/dryer. There is a kitchen table seating 4. Basic foodstuffs are in the cupboards eg cooking oil, herbs, sugar etc. This is in the kitchen although there is a gate-leg table in the living area which could be used if needed. There is a selection of books which you are very welcome to borrow. There is a small collection of cards, puzzles etc in the cupboard in the living room. There is a small lawn but the rest of the garden is planted with fruit and vegetables. These can be picked on request. We do not provide equipment but there are several good River Wye canoeing companies which use a launch site in the village. Several good golf courses are within about 10-20 mins drive: Ross on Wye golf club; South Herefordshire golf club; The Rolls golf club, Monmouth; Tewkesbury golf club. Notes on accommodation: While the main bedroom is perfect for a couple, the second bedroom is very small with just a single bed. Also because of the size of the cottage we reluctantly can't allow pets-there is nowhere to put muddy dogs while they are drying off. Tescos or Waitrose can deliver here. No smoking in the cottage please. Outside: The garden is small but well tended with a bench and table to sit at while admiring the view. A small barbeque is also provided. Cleaning / Towels / Linen / Maid service: Towels and bed linen are included in the rental and changed on a weekly basis for longer staying guests. For guests staying longer than one week, the cottage will be cleaned by appointment. Please leave the cottage in a clean and tidy state on departure. Very comfortable, cozy and snug cottage; set in some lovely tranquil setting. Very recommended. I stayed with my husband and son at stone cottage for a long weekend. We had a wedding to attend in Brockhampton which was only about 4 miles away. The cottage was lovely, set in a rural location. Very peaceful and had everything you would need for a comfortable stay. The large bed in the main bedroom was so comfortable that I didn't want to get out! We had a lovely roast lunch at the local pub on the Sunday and as it was pouring with rain, went back to the cottage and lit the log burner. Perfect!! Thank you for your kind comments, I'm glad you enjoyed your stay. Very friendly owner,comfy atmosphere,stunning views,nice local cider ,the best fishing.will be back,the silence is wonderful. Antonia's cottage is one of the nicest vacation rentals we've stayed in. The cottage is clean, well-equipped, and tastefully designed to incorporate a "cottage" feel with all modern conveniences. (The larger-sized fridge and freezer are wonderful to have when you're self-catering for a week.) The rooms are bright and comfortably furnished. The garden catches the sun--a lovely place sit and admire the view. It was a great central location for both the historic sites we wanted to see in the area and walking. We enjoyed the Three Churches and a Bridge circular walk you can do straight from your door. (See Wye Walker D1) Hoarwithy itself is a friendly community-- do go for cake and tea at the church if it's on when you're there. Thank you for your lovely review. It is very pleasing to have such enthusiastic guests, I enjoyed meeting you. A beautiful peaceful cottage in a glorious setting. Well-equipped, warm & welcoming. We originally booked for two nights but ended up staying for three as we were snowed in! It was a wonderful break. The cottage is warm and welcoming and has everything you need, a real home from home. Relaxing in front of the log burner while it snowed outside was glorious. Antonia was an excellent host, ensuring we were well looked after but giving us plenty of privacy. Due to heavy snow we couldn't venture far but enjoyed walks in the lovely countryside surrounding the cottage, and the short wander down to the New Harp Inn where we found the food to be delicious, and the landlords & locals friendly and welcoming. We loved Stone Cottage and highly recommend it. Thank you for your generous review. I enjoyed meeting you and am glad you enjoyed your wintery stay. I found your snow angel on the lawn, very pretty! A car is essential for this location, the nearest train station being in Hereford, 8 miles away. There is a bus service to Ross and Hereford but it is infrequent. Birmingham, Bristol and Cardiff Airports are all about 1 1/2 hour's drive from the property. Stone Cottage is situated just outside the picturesque village of Hoarwithy, within 10 mins walk from the village pub, The New Harp Inn. Ross on Wye is 5 miles south, a market town with antique shops, pubs and restaurants. Hereford is about 8 miles north with its cathedral, medieval chained library and Mappa Mundi, leisure centre and swimming pool. It too has good shops and restaurants. Hay on Wye is about 30 miles with its jazz and book festivals and antique shops. The Wye Valley is a walker's paradise with hundreds of footpaths covering spectacular countryside. On the border with Wales, there is much historical interest with Offa's Dyke nearby and the border castles of Goodrich, Skenfrith, White and Grosmont. Tintern Abbey is within easy driving distance as are the Malvern Hills and Black Mountains. Other activities include fishing, canoeing (a great fun activity for all the family) and children's adventure parks in the Forest of Dean. 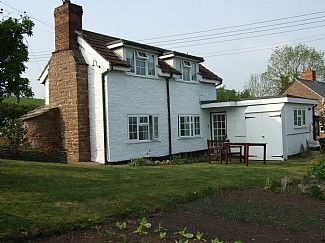 The property does not come with its own fishing on the Wye, but makes ideal accommodation for those fishing the Middle Wye beats. For racing enthusiasts the courses at Hereford, Ludlow, Chepstow and Cheltenham are all within striking distance. Booking Notes: Deposit of 25% is required to secure the booking,balance to be paid 4 weeks prior to start of the holiday. Bookings made less than 4 weeks before the letting date must be paid in full. Refunds less the initial deposit will be paid for cancellations up to 21 days before the holiday. Cancellation after this time will result in forfeiture of the full rental unless we can re-let the property for those dates. Cancellation insurance is recommended. A refundable damage deposit of £100 is required. Changeover Day: Friday is the preferred changeover day for weekly lets with access from 4pm on the first day. Guests should depart by 10am on the last day. Shorter lets with a minimum of 2 nights are negotiable separately. Notes on prices: Prices are quoted in £ sterling.